Our days are quite full . . . typically starting no later than 7:30 a.m. and will go until 9 p.m. with dinners/receptions often going later. Ambassador to Israel: Our first day started with a reception with the Ambassador to Israel. It was very interesting to hear his passion for the state of Israel. Ministry of Health: We met with Dr. Itamar Grotto, Associate Director General, Israel Ministry of Health, who is the #2 person over Israel’s healthcare system. In our time together, he was able to overview how the government provides universal coverage for the entire population. Chemi Peres: Chemi Peres, Founder of Pitango Venture Capital and the son of Shimon Peres, former President of Israel, was a keynote speaker. He delivered a very inspiring story of his father’s vision for the country of Israel as it was being developed in the 1970’s. He shared how it was a nation of immigrants surrounded by enemies. His father believed the greatest weapon of defense for Israel would be their brain . . . so everything that was created by the government was always done with a mindset of collaborative innovation. It is not uncommon even today for the Israeli government to provide matching funds for investment into start-ups . . . the result of this mindset has attracted both capital and talent into this region. Sheba Medical Center for Innovation: It was originally built as a military hospital by the United States in 1942. At the end of the war, it was converted to a civilian hospital as immigrants began to arrive in 1952. Today, Sheba is the largest hospital in Israel with more than 2000 beds covering a 200-acre campus that includes four hotels, two shopping malls, a lake and much available land for expansion. The most remarkable learning from our time at Sheba was the commitment to innovation. Sheba has 20 start-up companies onsite with a goal of increasing that number to 200 in the next few years. Once these start-up companies are vetted and selected to join the program, their management team is invited to work onsite and treated as though employees of the hospital (badges, scrubs, orientation, staff access, etc.) Sheba works with these companies to develop new ideas that will enhance patient care and/or work flow. Sheba will on occasion negotiate a license fee in certain situations but presently does not require an equity position. As new innovation is successfully implemented and appropriately proven, Sheba will make introductions of the start-up to other health system partners (i.e., Texas Medical Center, Mass General, Intermountain, etc.). It had been noted by several speakers this week that, while Israel is a place for great innovation, the country is too small for adequate commercialization unless they look outward . . . and most likely to the United States. This delegation was purposely designed to help educate the Israeli market to see how their innovation can be paired with the distribution network represented by our group. In closing, I must share the photograph below which demonstrates the reach of the UT fanbase. 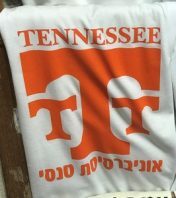 This shirt was found in the Jerusalem’s Old City marketplace!